Do not give up! Believe that you could defeat lung cancer ! With the advantages of small trauma, quick efficacy and few toxic side effects, microwave ablation has become the “emperor of all maladies---cancer”. Microwave ablation has brought new hope to a lot of cancer patients in Modern Cancer Hospital Guangzhou. In this article, I will share a story of a lung cancer patient who underwent microwave ablation and got good efficacy. This patient is Angelo (Alias) from Philippines, 50 years old. In May 2015, Angelo noticed there was a lump in his neck when he was on vocation in New Zealand. At the first time, doctor and he did not pay attention to this and thought it was just a common lymph node. However, after seven days his lump did not turn good but deteriorate with pain and enlargement. He came back to hospital for a further check and took biopsy. And the result showed that that was a malignant tumor. He cried and felt upset, confused, despaired when he was diagnosed with cancer. His wife, son and daughter were all at a loss. 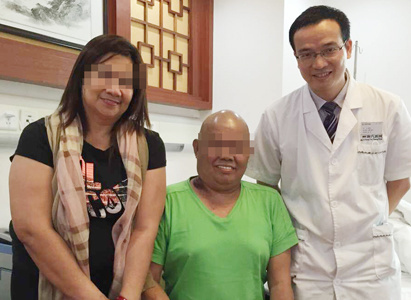 Angelo’s elder sister knew a colleague who had liver cancer and gained great improvement in Modern Cancer Hospital Guangzhou. That story deeply encouraged him and his family, so they decide to Modern Cancer Hospital Guangzhou with hope. 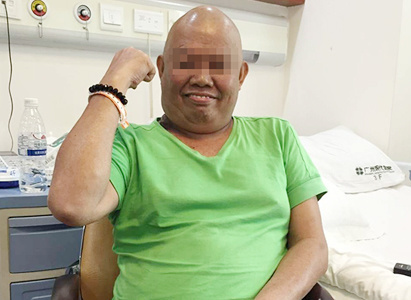 After a further check-up, doctor found out that the tumor in his neck was caused by cancer metastasis and the primary tumor was in his right lung. The cancer had developed to 3B stage, that is to say, it was lung cancer in middle and advanced stage with metastasis in his neck. The tumor in his neck developed quickly and the tumor in his neck was larger than in his right lung. According to Angelo’s individualized condition, doctors in Modern Cancer Hospital Guangzhou made a comprehensive plan of “cryotherapy + interventional therapy + microwave ablation”. Microwave ablation brings an obvious effect to kill the tumor. When conducting microwave ablation, the doctor introduces the microwave ablation needle into the tumor percutaneously under the guidance of imaging machine and then the needle outputs microwave. The needle heads are equivalent to a “mini-microwave”, which persistently releasing microwaves. Polar molecules in the tumor tissue will perform high-speed movement under the action of the microwave field; generate heat to warm the tumor tissue. When the temperature rises above 60℃, the proteins of tumor cells will be denatured coagulation, resulting irreversible tumor cells necrosis. Under Microwave Ablation, when tumor tissue is killed by heat, it can also produce heat shock proteins, which have effect on stimulating the patient’s immune system, improving immune function and playing a role in inhibition of tumor cell proliferation. It is mentionable that microwave ablation needle with 2mm diameter has a water circulation system, allowing the temperature of central position of the needle to maintain at an acceptable range. Therefore, this technology brings small trauma to skin and the other organs and won’t cause major harm to the human body. In order to gain a better efficacy, doctors also combine interventional therapy and cryotherapy to treat Angelo. Angelo told us that only interventional therapy brought a little pain and other treatments did not bring any discomfort to him. At present, the tumors in his neck and in his right lung have obviously shrunk a lot and he has not showed other discomfort. Microwave ablation brings hope to him!